This CD features one half of 1971's "Superpak" compilation, originally released as a 2-Lp set on UXS-77. See my comments regarding this reissued compilation below the liner notes. Cover illustration by Peter Palombi. A tidal wave of sound, mammoth, reaching and filling a vast expanse; the subtle, gentle but forceful entrance of one piano and then another over the first. A theme stated, then restated—variations derived from stings, flowing dynamics, human voices. A common enough technique, but not in 1959, when it was considered a radical departure. A piece of music written by a contemporary composer with obvious commercial appear, arranged in the classical tradition and performed by acknowledged classical masters. “The Theme From the Apartment” was the first big recorded hit for Ferrante and Teicher. Within the first three weeks, it sold over 750,000 copies and was a certified Gold Record before another month went by. Its success completely altered the lives of these two pianists, and the vast listenership of Middle America. After the fact, when a performer is on stage, it’s easy to see the dedication that cultivated his talent; the many years of hard work to refine his talent, more difficult it is to recognize beforehand. At the age of two, Teicher was picking out melodies on his parents’ piano in Wilkes-Barre, Pennsylvania. After several teachers had met with the boy’s parents, they were persuaded to enroll him in the Juilliard School of Music in New York. Similarly, Ferrante was also a child prodigy at the keyboard, and he, too, entered Juilliard at a young age. Progressing through the school’s Preparatory Center, they were coupled at the age of six for a duet demonstration. Being the same age the combination seemed a natural, and a fast friendship developed. The ensuing years saw the duo together in composition classes, musical theory classes, technique, orchestration, and conducting classes. When ensemble music was employed, the boys played together. Finally they decided to become a team and enlarge the possibilities of the classical duo. Switching from duets to two pianos, the range of musical variations increased geometrically. Their teachers encouraged them in their experimentation. They devoured everything from pre-Bach to contemporaries such as Cage to Schoenburg to Stravinsky. Finally, in 1948, they graduated. Finding little in the way of employment opportunities for a two-piano team, they both accepted appointments to the faculty of their alma mater teaching composition and theory. This was a little bit dull after the hectic pace of being child prodigies. Their luck took a turn for the better after a guest appearance as soloists for the Toledo Symphony Orchestra. They were so successful that they were able to arrange a concert tour for themselves. In this day and age, when air travel is as easy as going two stops on the local subway, it’s hard to remember what being on the road meant to a musician in the 1950’s. In order to make ends meet on their tour, Ferrante and Teicher alternated at the wheel of the truck that housed their two Steinway grand pianos. When they hit the next town, they were responsible for loading and unloading of their equipment. Although this was not a very financially rewarding time, they received favorable critical acclaim wherever they appeared. Playing in the classical tradition, they would perform the compositions of the great masters, then, for a switch, they would perform contemporary numbers utilizing several devices to alter the natural tone of the piano. They were able to produce a range of instrumental sounds that ran the gamut from banjo to drums to harpsichord. Critics saw that F&T had the rare ability to make even the most difficult pieces understandable to an entire audience; further, they endowed those works with contemporary flourishes, at least in the conceptualization. All artists must pay their dues to develop and refine their art for its ultimate acceptance. On the road Ferrante and Teicher were acquiring the techniques that would make them the world’s most successful piano duo. It seems that, even in our time, most great artists, have to wait and struggle for the realization of a dream. Ferrante and Teicher continued to have dreams of being successful pianists, able to support themselves by their performances, while they traveled from city to city on weekends with pianos loaded in the back of a truck. During the week, they taught at Juilliard where they were the youngest professors on the faculty. Finally something happened that made their lifetime investments pay off. Well-known arranger/composer Don Costa approached Ferrante and Teicher with a recording offer. They listened to his ideas, expanded on them, and presented the scheme to United Artists Records. The label was sold on the concept. Together with a forty-six piece orchestra and Costa as producer, F&T entered the studio. The result was the instantaneously successful “Theme From The Apartment,” a popular movie theme approached and presented in a creative classical manner to the American public. The acceptance of the concept was overwhelming. Middle America could relate to the melodies that Ferrante and Teicher played while getting exposure to the high brow classics that they had, in the past, evaded. It was the first introduction for many Americans to that precise and serious art form. From the success of “The Apartment,” there ensued a crescendo of even higher plateaus. The theme music from the motion picture “Exodus” has sold over two million copies to date. “Exodus” confirmed the convictions of the artists and the label that the American public was seeking a mediator between the rigidity and inaccessibility of concept piano and the emotions and experience of their daily lives. This triggered an entire spate of movie theme music which changed the lives of the duo while establishing their fame and fortune. “Lawrence of Arabia,” “West Side Story,” “Lisa,” “A Taste of Honey,” “The Bible,” and many others followed in rapid succession, all spiraling to the top of the national charts, further confirmation of the vast impact made by the two-piano team. There was a sprinkling of imitators of their style who began to appear briefly on the musical horizon, then they quickly became anonymous among the multitudes of disillusioned artists who never achieved success or recognition. But, F&T, alone, remained consistent in their productivity and success. They established a style which, although it has been widely imitated, is still uniquely and identifiably their own. Although widely compared with other pianists, the principal similarity between Ferrante and Teicher and some of their contemporaries is that they make their livelihood manipulating those ivory and black keys for the public. A solo pianist, even though he may concentrate on the same area of music, has the privilege to deviate from the disciplined structure of the arrangement. Ferrante and Teicher are definite and precise with none of the casual ad libs permitted the soloist. They are definitely a one-of-a-kind (two-of-a-kind) act. It appears that this 2-Lp set remained in print until after EMI/Libery took over. In 1986, the Pheasant Lane Mall opened in Nashua, NH and I was able to purchase a leftover United Artists set at a newly opened record store. Sometime around 1989, EMI released three Ferrante & Teicher CDs. The People's Choice was wonderful and worthy of a CD reissue. 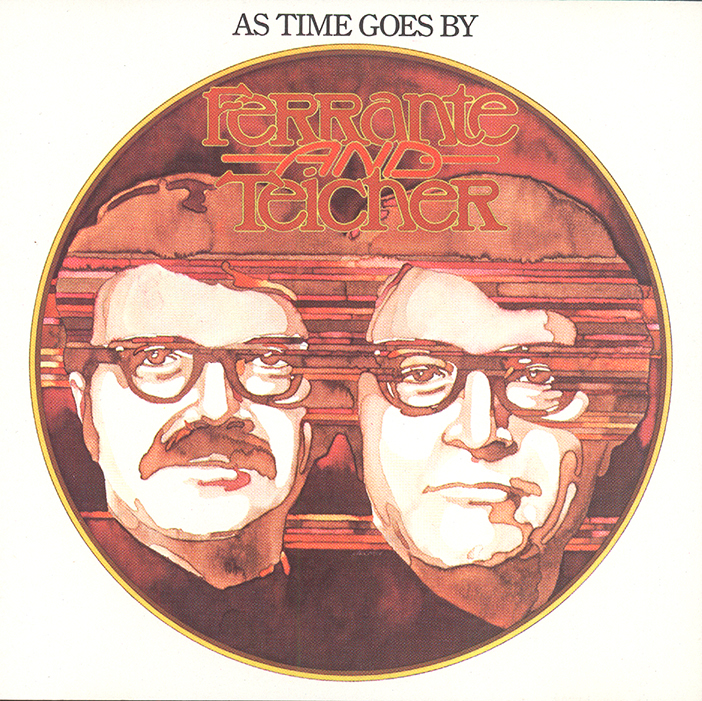 However, instead of choosing two other "original" albums, they instead wasted their reissues on two "abridged" compilations: The Best Of Ferrante & Teicher (just Record 1) and this release of As Time Goes By. Neither compilation had great sound quality.